Creates glowing light from the edges of the source clip. This differs from the default Glow in that small or thin objects generate as much glow around their edges as large objects. Also the glow colors are not affected by the colors of the source clip. Source: The current layer. Edges are extracted from this input clip to determine the glow locations. Glow Brightness: Default: 2, Range: 0 or greater. Controls the overall glow brightness. Set to zero to get no glow. Scales the color of the glows. Scales the red glow width. If the red, green, and blue widths are equal, the glow colors be uniform with distance. If they are not equal, the glows will vary in color with distance. Edges Smooth: Default: 0, Range: 0 or greater. Determines the width of the extracted edges which generate the glows. Edges Brightness: Default: 1, Range: 0 or greater. Scales the brightness of the edges before the glows are applied. Edges Threshold: Default: 0.5, Range: 0 or greater. Increase to remove glows on the less sharp edges. Result: Normally the glows are combined with the source or background, and output. 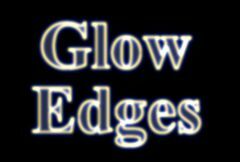 Edges: The edge image only is output, before any glows are applied. This can be helpful while adjusting the various edge parameters.